2009. He lives in New York state. ANDREW ZORNOZA is a writer and visual artist born in Houston, Texas. which the code forbids breaks the code." - ???? find out. You're invited in. 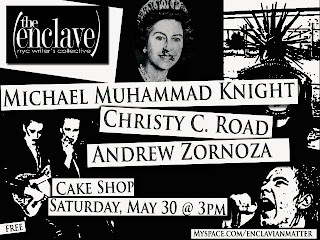 other upcoming Enclave events go to: myspace.com/enclavianmatter. 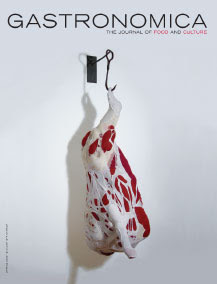 The spring issue of Gastronomica is out! Andrew's "Restaurant Round-Up" graces the final pages as the fiction selection for this edition. RR is the story of a food critic wandering a post-apocalyptic New York trying to keep the city gastronomically relevant while making peace with the past. It's an ode to a world to short-lived for the likes of Dom DiFara, the Second Avenue Deli, Delmonico's, Taqueria CanCun, and Spumoni Gardens. . . .